We all know what happens; we read journals, magazines websites and emails; we gather information from a vast array of sources and then promptly forget where it came from. As I was drinking a coffee whilst waiting for an appointment today, I had a brain wave. “I know” I said to myself, “I’ll create a regular tidbits post where I can store the most interesting things I come across”. Perhaps you might find something that’s of interest as well. The Bookseller reports that ebook sales in 2012 accounted for approximately 14% of total book unit sales, however this is not all good news as, although more books were sold in 2012 than in 2011, overall revenue was lower; this is probably because ebooks are that much cheaper than their physical counterparts. First up is the news that the wayback machine from the Internet Archive has had a bit of a makeover and has now indexed an additional 90,000,000,000 URLs, bringing the total to 240,000,000,000 images of web sites dating back to the earliest days of the web. I decided to have a look back at the earliest recorded image the site that eventually became The Hysterectomy Association; this was the site I created as part of my original MSc in Information Science. 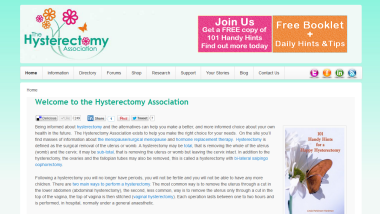 The image below it is The Hysterectomy Association as it was in January 2013! You may be wondering why the wayback machine is a useful tool. Well, it’s great for research purposes, what about checking dates, facts and documents or even statements issued and news added. You can find it at: http://web.archive.org. Finally, we have a lovely little video celebrating the library from Arthur who claims that ‘having fun isn’t hard when you have a library card’ – cute but could be annoying on the fifth round 🙂 I’d like to know why that librarian looks just like the archetypal librarian though? I like tid bits – thanks Linda! Some interesting tidbits here Linda. It may be that although the overall revenue is down it is not the authors that are losing out, as they may even receive more for the sale of an ebook, or more overall due to higher sales and no ongoing production costs. It would be interesting to see how that revenue is then apportioned. And yay for the library! Our refurbished community library reopens on Thursday, now run by volunteers as it is no longer operated by the council. You’re welcome, I love the wayback machine, I did fear it was going to leaving us and am pleased it isn’t. I used the wayback machine to look at my very first website from 2001. How nostalgic! That was fun, Linda. Thanks for sharing the link. I didn’t even know such a thing existed.